The AIM-120 AMRAAM (Advanced Medium Range Air to Air Missile)) is a high-supersonic, day/night/all weather Beyond Visual Range (BVR), fire-and-forget air-to-air missile. It has a high-explosive warhead and relies on active radar homing for the final stages of flight, being launched on inertial mid-course guidance without the need for the fighter to keep the target illuminated. Its capabilities include look-down, shoot-down, multiple launches against multiple targets, and intercepts at very short range in dogfight situations. the AIM-120 is used by a variety of Western fixed-wing combat aircraft, and is a decisive factor in most ongoing Middle East aircraft procurement programs. Unit cost is about USD $386,000. In the mid-1970s, it was recognized that the AIM-7 Sparrow would be in urgent need of replacement in the 1980s. Even the upgraded AIM-7F/7M was becoming long in the tooth, and the AMRAAM program was initiated in 1976. A joint USAF/USNavy program, it aimed at producing a high performance air intercept missile, featuring a higher probability of kill than any conceivable advanced version of Sparrow, packed in a smaller, lighter, cheaper, and more reliable airframe. On top of that, the new missile had to be compatible with existing fire control radars, and physically fit where a Sparrow was previously located. Ambitious research projects were started, to investigate into all-new guidance and target-detection methods, such as target classification by aerodynamic noise, laser scanning of the external shape, or decomposition of the engine sound harmonics in the frequency domain. None of these techniques materialized however. The original list of five proposals was narrowed down to 2 in February 1979. Both contractors received a contract for ten prototype missiles each, which were to be fired from F-14, F-15 and F-16 aircraft. At the end of 1981, after only 6 missiles were fired (3 each), Hughes Aircraft & Missile Systems Group was picked over Raytheon to build 94 test missiles, with an option for 924 full production missiles. The AMRAAM program entered FSD (Full Scale Development) in September 1982, and test firing of the missile started in that same year at Holloman AFB and NAS Pt. Mugu, with the missile proving itself against increasingly tougher targets. The fact that no European counterpart for the AMRAAM exists, is due to an MOU (Memorandum of Understanding) signed by West Germany and the UK, assigning AMRAAM to the USA and ASRAAM (Advanced Short Range Air to Air Missile) to Europe. 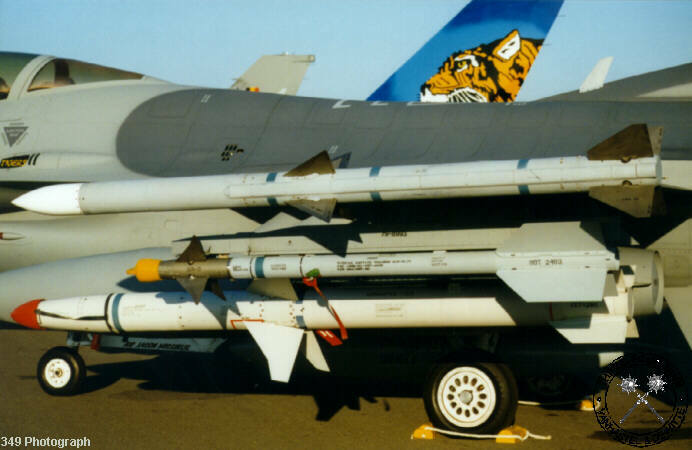 By 1985, AMRAAM was in serious trouble: huge cost overruns and delays meant that not a single test round was fired in a hostile ECM-environment until October 1986. By this time, some of the problems were solved and low-rate initial production (LRIP) was approved for FY 1987. Production is split (under Caesar's 'Devide and Conquer' motto) between two contractors, Hughes and Rate. Of the initial 180 missile, USD $537.4 million (four times higher than estimated) order, Raytheon produced 75 and Hughes 105 rounds. The subsequent FY 1988 order for 630 missiles was split 55/45 with the biggest share for Hughes. Continued LRIP was approved in May 1991. In September 1991, IOC (Initial Operational Capability) was achieved for the AMRAAM on USAF F-15 aircraft. The F-16 followed in January 1992, and the Navy in October 1993. Full-rate production of the missile was approved in April 1992, marking Milestone III. The AMRAAM is housed in a light-weight structure of steel and titanium. The airframe is divided into four major sections: guidance, warhead, propulsion and control. The four wings and fins are detachable. The guidance section features an active X-band radar terminal seeker using a highpower solid-state transmitter with a low-sidelobe, wide-gimbal antenna, and a built-in radio-frequency processor. Navigation, autopilot, radar, datalink, fuzing, sequencing, and self-test functions are allhandled by a single 30MHz microprocessor. The propulsion section consists of an advanced solid-fuel rocket motor to achieve a speed of Mach 4 and a range in excess of 30 miles. In long-range engagements AMRAAM heads for the target using inertial guidance and receives updated target information via data link from the launch aircraft. It transitions to a self-guiding terminal mode when the target is within range of its own monopulse radar set, operating in high-PRF mode. Since this seeker uses its own active radar (unlike the Sparrow), it does not require the launch aircraft to illuminate the target or to track the target. In case the target tries to protect itself with active jamming, AMRAAMs seeker switches to a medium-PRF "home-on-jam" mode. With its sophisticated avionics, high closing speed, and excellent end-game maneuverability, chances of escape from AMRAAM are minimal. 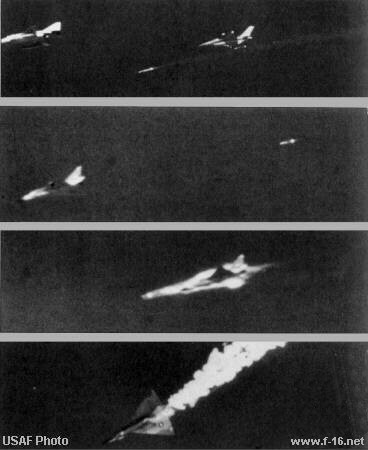 Upon intercept an active-radar proximity fuze detonates the 40-pound high-explosive warhead to destroy the target. At closer ranges AMRAAM guides itself all the way using its own radar, freeing the launch aircraft to engage other targets. The lethal range of the 40lbs. blast fragmentation warhead has not been disclosed. The AIM-120B missile was the result of the two block AMRAAM Producibility Enhancement Program. The B-model incorporates a new digital processor, erasable programmable read only memory, and five major electronic unit hardware chassis upgrades. The AIM-120C will include a redesigned warhead and improvements to the rocket motor, fuzing logic, guidance algorithms, and ECCM logic. Modified for internal carriage on the F-22, the AIM-120C will have "clipped wings" to reduce its box size from 17.4 to 12.5 inches. The APG-66 radar fitted to the F-16A/B was not originally intended to have the capabilities of handling BVR missiles such as the Sparrow or the AMRAAM. Indeed, the whole concept of the cheap, light-weight fighter excluded fitting of SARH or ARH missiles. However, the need for a BVR capability became apparent soon after the F-16A/B entered service. The long-term solution was to be the AMRAAM missile, which was originally scheduled to enter service in the mid-1980s, but was delayed by a protracted series of developmental difficulties. Possible interim solutions were considered, amongst others the British Aerospace Skyflash or the Raytheon AIM-7 Sparrow. The first tests of a Sparrow-armed F-16 were made by General Dynamics with inert rounds attached to the wingtip, to the underwing pylons, and even to a pylon being attached to the mainwheel door. The undercarriage door location was used for some test firings with the Sparrow in November of 1977, and a test launch with a BAe Skyflash was made a year later. Ultimately, F-16A/B aircraft were modified into the F-16A/B ADF aircraft, and were capable of firing the Sparrow. When the MSIP Stage II was approved for the F-16, AMRAAM was far from ready. However, the associated ECP350 (Engineering Change Proposal) included changes to the wiring of the wings and aircraft structure, so that the AIM-120 could be retrofitted easily later on. Block 10 introduced the stronger wing structure necessary to carry the missile, the wiring and software came later. Some Block 10 and 15's got retrofitted with the software/wiring, but others didn't. So basically all F-16s from Block 10 onwards are structurally AMRAAM-capable, although some A/B models lack both the wiring and the software, and although the C/D models have the wiring, some of them do not have the necessary software. The latter depends on whether the customer is subject to export restrictions or not. On the F-16, AIM-120 AMRAAMs can be loaded on stations 1 and 9 (1 missile each, wingtip), 2 & 8 (1 missile each), and 3 and 7 (2 missiles each). The first ever fully guided AIM-120 to be fired, was fired from an F-16 and scored an almost central hit on the QF-102 target drone, which burst into flames and crashed. The missile did not even carry a warhead. A small number of AMRAAMs were carried by F-15 aircraft during Operation Desert Storm, though none were actually fired. The AIM-120 was redeployed to the Persian Gulf in 1992 for use on F-15 and F-16 fighters. 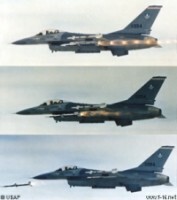 In December 1992 (Operation Southern Watch), an F-16 pilot fired the first AMRAAM in actual combat, shooting down a MiG-25 Foxbat during a confrontation over southern Iraq. The AIM-120 was also used in another engagement in Southern Iraq, and successfully downed the target. 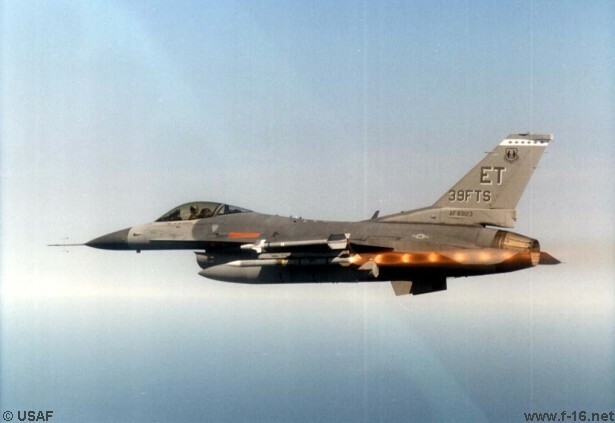 The F-16 Fighting Falcon scored a third AMRAAM kill in Bosnia. Contractor: Hughes Aircraft Co. and Raytheon Co.